Senior Government officials and diplomats in Brussels, the UK, and other European Union capitals have said the deal will be presented at a yet-to-be arranged summit in the Belgian capital before Christmas. According to respected political website Politico differences still remain between the two sides, particularly on how to solve the Irish border issue, but the diplomats claimed that if a deal is clinched, it will be quickly approved by EU27 leaders. It would be seen as a pivotal moment for under-fire Prime Minister Theresa May, with the step up in momentum helping her force the deal through Parliament before opponents can challenge it in any great detail. Britain and the EU are now working closely to get the deal over the line, intent on avoiding any issues that critics could potentially pick apart and delay the process further. Officials claim the withdrawal deal is close to completion, with the final push focusing on the “political declaration”, the document outlining the framework of the relationship that will accompany the withdrawal treaty. Politico said that according to the EU 27 officials and diplomats working on Brexit, the final compromise will reflect some aspects of Mrs May’s much-criticised Chequers proposals and will remain specifically vague to reduce the potential of more challenges. According to a senior UK official, one proposal being put forward to avoid any debate over this vagueness is to make the final document a combination of “high-level aspiration” in certain areas and “incredibly detailed agreement” in others. 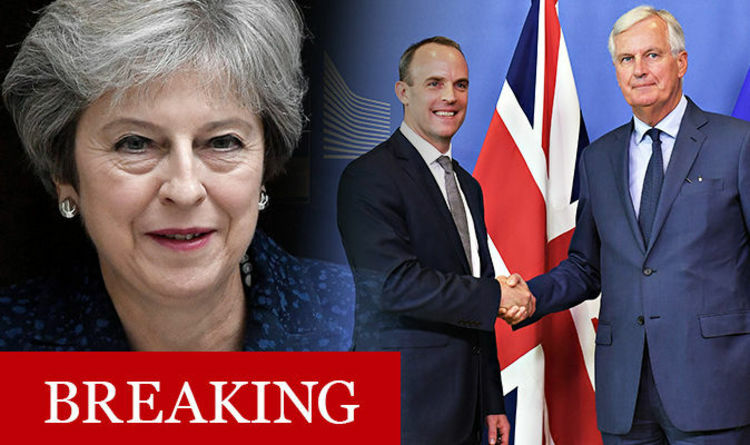 Another EU official said that during a meeting on August 22 with the EU’s chief negotiator Michel Barnier, Secretary Dominic Raab called for a legal guarantee on the future framework to be implemented into the Withdrawal Agreement, both on the process and the outcomes of it. But the official said this was “not possible” while a second idea to be put into the political declaration could be that of “review clauses”, which would enable London and Brussels to agree potential problems with the agreement can be settled at a later date. A senior official told Politico these clauses should not give the impression of “perpetual divorce” but could help calm any fears from Brussels that Britain could emerge with “competitive advantages”. Both sides have now agreed on the need for a future “political joint committee”, which would be staffed with officials from both sides and sit under a joint ministerial committee that would meet regularly to help solve discrepancies. Despite the positive signs that a deal could be agreed following one-last marathon meeting in November, there are still a number of hurdles to overcome. On Thursday, Mr Barnier will brief EU leaders at an informal summit in Salzburg, Austria where the political declaration will be discussed in detail for the first time. He would then begin drafting the text. The Northern Ireland border issue remains a potential stumbling block, so EU officials said reaching a resolution on the withdrawal agreement will require reassuring language to ensure Dublin feels its interests are protected. But one EU diplomat told Politico this would need a rare concession from Mrs May, who has so far rejected the EU’s backstop plan aimed at avoiding the need for a hard border. Once the final withdrawal details are agreed, Mrs May would then have to get it through Parliament, but Brussels fears failure to do so could trigger complete chaos, such as a general election or a second Brexit vote. Politico said it approached 14 diplomats close to Brexit negotiations and not one said they believed the UK is serious about exiting the bloc without a deal.